The Institute of Buddhist Studies is pleased to provide the following student exchange programs for our regular degree program students, giving them the opportunity to study Buddhism either in Japan or Taiwan. 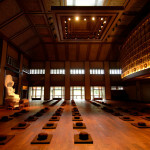 Each year two students from IBS are able to study Buddhism at Ryukoku University in Kyoto, Japan. This program is open to degree program students only. Up to twelve units of credit may be earned in this program. Grounding in conversational and basic reading Japanese is required. Opportunities to study Japanese language are available through this program, but for all other coursework the language of instruction is Japanese. Tuition and fees for this program are the same as for regular IBS classes, and are payable directly to IBS. 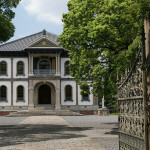 Housing is provided by Ryukoku University. Transportation, food and other incidentals are at student’s own expense. Scholarships are available to support study in Japan. Each year two students from IBS are able to study Buddhism at Dharma Drum Institute of Liberal Arts, located just outside Taipei, Taiwan. This program is open to degree program students only. Up to twelve units of credit may be earned in this program. Grounding in conversational and basic reading Chinese is recommended, but not required. The program provides opportunities to study Buddhism in English and to simultaneously study Chinese language. Tuition and fees for this program are the same as for regular IBS classes, and are payable directly to IBS. Food and housing are provided by DILA. Transportation, study materials, other food and incidentals are at student’s own expense. Image courtesy of Dharma Drum Mountain Foundation.